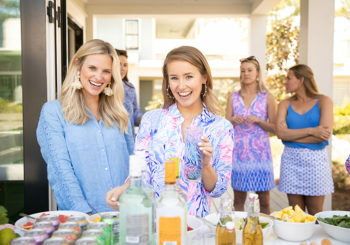 It’s hard to believe just this time last week, all of my girls and I were hanging out in Watercolor, Florida with Lilly Pulitzer! I just received all of the images back from my wedding photographer John, and Y’ALL. I just can’t wait to share all the fun with you this coming week! Adjusting back to the grind this week after such a fairytale weekend away proved to be quite the challenge, but some major wedding developments took place that have left me completely elated and exhausted now that we’ve reached Friday! Let’s just say I have some big news to share soon! EEK! I’m currently typing this as I sip my afternoon cup of joe before packing up and heading off to one of my very best friend’s… wait for it… bachelorette weekend! Yes, you read that right, two bachelorettes in a row! Amanda, who you can read more about here, is an absolute ray of sunshine, and I absolutely can’t wait to celebrate her this weekend. It’s been so hard catching up these days while we both plan weddings in different cities, so needless to say I am thrilled for time with her and so many friends at the lake! Since I seem to be smack in the middle of #BacheloretteSeason this week, I thought it would be fun to break from our typical roundup of the cutest new arrivals to hit the web, and instead focus on some fun bachelorette party decoration ideas! There are so many fun options these days (here is an entire boutique dedicated just to bachelorettes!) so I hope this collage gives you a fun bit of inspiration whether you’re planning a bachelorette party now or will sometime in the future! Let’s just say, between the Lilly Pulitzer team and my sweet bridesmaids, my bachelorette weekend was filled with so much fun. Just wait for the photos! So without further ado, have fun checking out these cute items! I’ve been a busy bee checking off some major items this week, so forgive me for being a bit absent on Instagram/IG Stories! It was one of those weeks, y’all, and I have a feeling the next few leading up to the wedding are going to be pretty similar. :) So thanks for hanging with me! Can’t wait to be back next week with all the #KatesLastSplash details y’all have been asking for! KATE. Oh. My. Stars. I had a blast following along on your bachelorette trip and can’t wait for all the fun photos and details! So glad you had an amazing time! These decorations are so cute! Such cute ideas!! 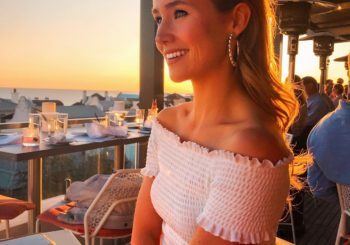 I seriously LOVED following along on your Lilly Pulitzer Bachelorette weekend! Seriously the ultimate dream!